The multi system operators (MSOs) GTPL Hathway and Scod18 Network along with three local cable operators (LCOs) have been booked by the Thane police for alleged violation of the contract and illegal transmission of signals of broadcaster Star India’s channels. 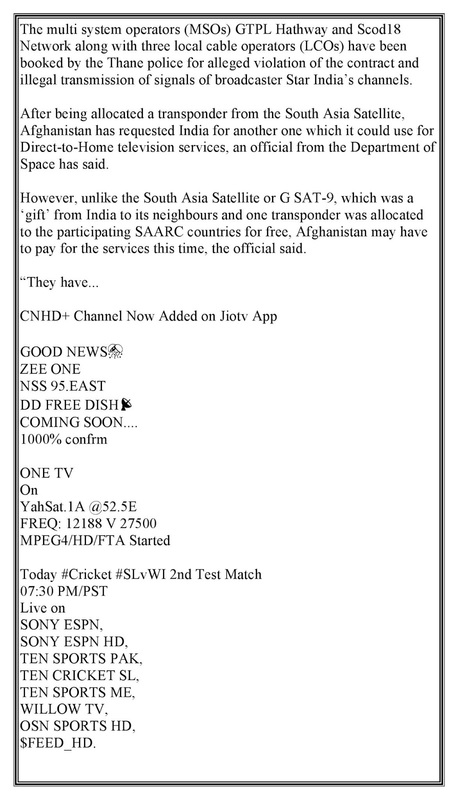 After being allocated a transponder from the South Asia Satellite, Afghanistan has requested India for another one which it could use for Direct-to-Home television services, an official from the Department of Space has said. However, unlike the South Asia Satellite or G SAT-9, which was a ‘gift’ from India to its neighbours and one transponder was allocated to the participating SAARC countries for free, Afghanistan may have to pay for the services this time, the official said.